I should probably wait until I’m finished knitting these socks to announce them, but I’m not going to. I am just so goofy excited about them. I can’t believe I’m almost done knitting my very first pair of socks! Woo-hoo! Knitting is a special art. I so admire the people who craft the patterns and work through all the formations to create shape and texture. The wooden needles I’m using are so smooth and are tiny works of art in themselves. The yarn is just plain mysterious. Some genius figured out to dye yarns to knit up into stripes and motifs. I am in complete awe. 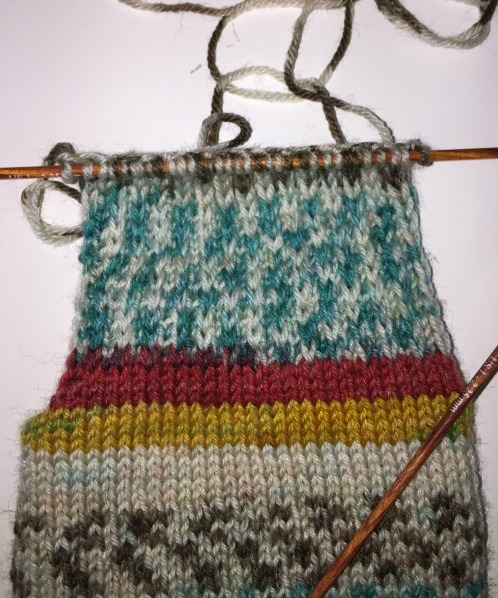 This pattern is the beginner sock from the Book “Super Socks” by Christine Perry, the Winwick Mum. They’re done on a 2.25mm circular needle with DPN’s used here and there when you can’t go around in a circle. The yarn is 75% Merino wool and 25% nylon, as suggested in the book. All supplies are from my little, local, sweetheart of a yarn shop, Blizzard Yarn & Fiber. I have to use great concentration to work through the instructions. I fumble with certain areas with the tiny needles and the slim yarn, even though I am an experienced knitter. I can hardly imagine actually putting these on my feet, stuffing them in my shoes and walking on them. Never before have I had socks that I considered precious. These socks shall never see the inside of a dryer. They will be washed and shaped and layed flat to dry. If they fail, I will darn them. 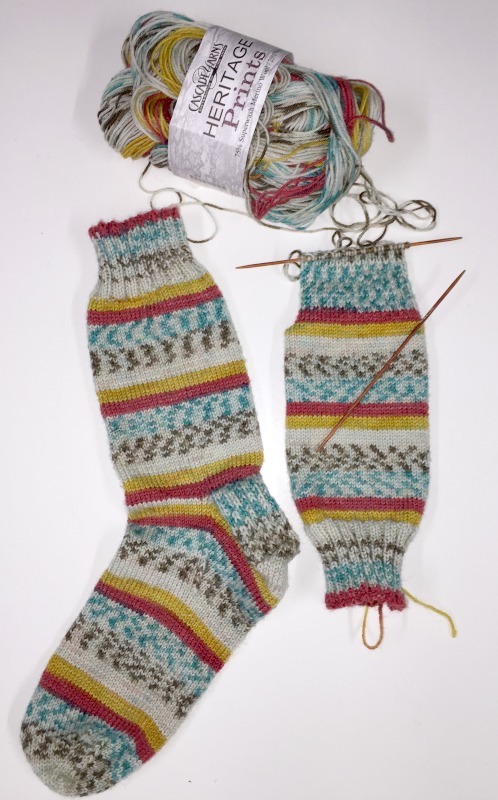 Far too much time and work goes into knitting socks to simply cast them away if they get a hole in the toe. Wow. Slow fashion feels damn good. I love these. I am amazed that you just decided to do this and you are doing it. I won’t knit socks but you have inspired me to get creative. So cute and special! You’re amazing. Oh my gosh! A comment! Hehe. Thanks, Rachelle!